Companies are looking for greater visibility of supply chain costs and activities so they can plan resources more efficiently. This year, we expect companies will be finding ways to optimise productivity through improved task management, advanced labour management and use of voice technologies in the warehouse. What are some of the local and international trends in WMS? As the speed and agility of supply chains evolves, the way in which labour resources are optimised needs to evolve in order to keep pace with the changing buying behaviours of consumers. When companies add the ability to change where and how products are fulfilled, they also need the ability to flex resources up or down to ensure they have the right number of people to support the real-time changes taking place at the store, in the distribution centres (DCs) and across their fleets. Plan and forecast annual workforce budget. Establish appropriate level of regular workforce for projected work. Optimise the mix of Regular, Overtime and Temporary. Plan for seasonal changes, new product introductions and promotions. Continually optimise staffing levels by day, shift job and zone. Also, companies around the world are looking at order management tools - solutions that are very complementary to the WMS. They help companies ensure that enough of the fastest selling products are re-ordered and routed to wherever demand is being detected and registered, thereby enabling the balancing, prioritising and streamlining of stock levels across the business. Bringing vital information to supply chain partners’ fingertips via sophisticated supply chain intelligence tools means the whole enterprise network can make smarter and faster decisions with regards to warehouse and distribution management. All of this is paramount, particularly as a supply chain elongates as a result of sourcing and selling from and to a greater number of global markets. 2. Are the majority of DC’s now managed with a WMS or still manually? In our experience the majority of the DCs over 100,000 square feet in size are managed by a WMS. There is a replacement and technology refresh trend in the marketplace however and those investments are driving new projects for our teams and products. Replacing a legacy or bespoke WMS is fairly common today as supply chain teams are focused on gaining new capabilities that can be supported and easily personalised at a lower longer-term total cost of ownership. Other trends driving WMS implementations include the construction of new, more efficient facilities and multi-channel fulfilment strategies in a growing number of geographies around the world that many companies are implementing to ensure a consistent brand experience while leveraging inventory efficiently to delight their customers. 3. Will the company be releasing any new WMS systems this year? What some of its main features, and advantages? Does it target specific sectors, or is it broad-based? Yes, we will be releasing major releases of all of our products in 2012, as we typically do in each calendar year. In general, we build new releases with a focus on balance and broad appeal. Our solutions are built on a common platform so that we can deliver a comprehensive, integrated set of products that are easier to install and maintain – so we always start with the platform requirements and the common needs. From there, we build product and industry-specific features based on prioritised customer and market feedback. Next, we aim to improve the user experience by improving the user interface, dashboard, and mobility components. We are also very focused on cross-application workflows, updated underlying technology components, and performance benchmarking. Overall, we aim to deliver the world’s best WMS product that will provide superior functionality for a broad set of customers at a very reasonable total cost of ownership. 4. Can you describe any recent, innovative projects you’ve been involved in? We’re seeing a number companies adopt the same system in multiple geographies around the world. Under Armour, the leading performance apparel brand, has recently completed the latest phase of its global supply chain enhancement programme. 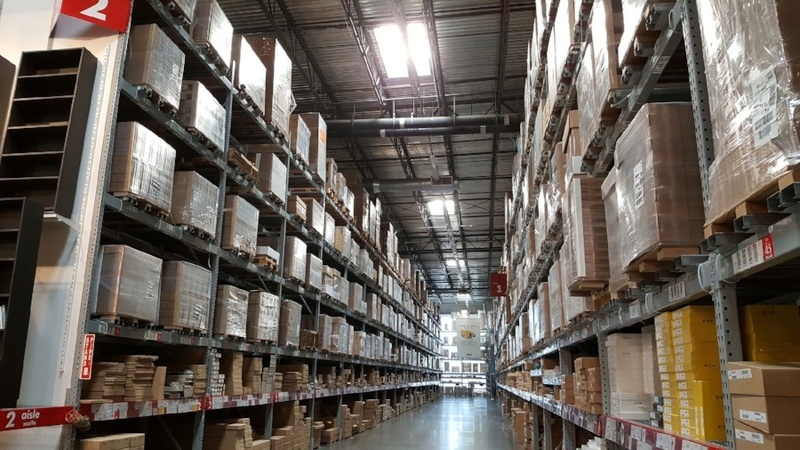 Having successfully used Manhattan’s technology for several years in the US - in DCs in Maryland and California – the company has successfully implemented Manhattan Associates’ Warehouse Management solution (WMS) at its 3PL-run fulfilment centre in Venlo, the Netherlands. The Dutch DC fulfils orders from 36 countries in the EMEA region. Under Armour has also completed a successful implementation of Manhattan’s web-based Extended Enterprise Management (EEM) solution to facilitate accurate, real-time data sharing with its suppliers. The EEM software allows the status of in-bound products and deliveries to be viewed and updated online and this can be done without it being a cost burden to suppliers since all they need is an Internet connection. SDV, the France-based global 3PL, has recently selected the same solutions to be rolled out at sites in Asia and Europe, whilst adidas, Alliance Boots, Bidvest Group, Columbia Sportswear, Jockey and Tesco just a few examples of other Manhattan customers that are using Manhattan solutions to support their operations in multiple countries around the world. Manhattan’ WMS can help companies of every size including those with large throughput volumes and high-velocity supply chains. Tally Weijl, the fashion designer with more than 350 stores in 24 countries across Europe and the Middle East deployed the powerful Manhattan WMS solution in its two DCs that handle more than 18 million items each year. The results speak for themselves. Picking productivity is up 20% whilst the Put-to-Store Process is 35% more efficient. In China, Sinopharm Holding Co, Ltd., the country’s largest pharmaceutical distributor, implemented Manhattan’s WMS solution to modernise its supply chain. “Manhattan Associates’ software has delivered impressive improvements to our service operations while streamlining the entire working procedures of our logistics centre. It enhances every step from receiving to inspection, through put-away, re-checking, packing and shipping,” said Gu Yimin, CIO of Sinopharm. 5. In the tight current economy, what role/benefits does a warehouse management system (WMS) offer? An organisation’s warehouse and its broader supply chain operate within an increasingly complex and dynamic world, so systems that run the supply chain can become a key source of competitive advantage, as well as an enabler for business growth. Supply chains in 2012 are required to be increasingly flexible, scalable and agile to address more and more specific market requirements across a wider number of channels and geographies. This is essential to ensure companies can maximise sales at every opportunity, make their extended supply chains as efficient as possible and protect the organisation’s brand equity. The WMS and the many systems that complement it including Extended Enterprise Management solutions, Supply Chain Intelligence tools, Labour Management, Slotting optimisation technologies and Distributed Order Management solutions really can make the difference. Is the company facing any challenges? While there is still a tremendous amount of economic uncertainty in the world, business performance in most of Manhattan’s key markets around the world appears to be recovering, slowly but surely. Manhattan’s most recent financial earnings announcement, released at the end of January, provides testimony to this. The company revealed record fourth quarter and full year earnings for the company as a whole, with total revenue for the year coming in at $329.3 million which was an increase of 11% compared to 2010. Looking at the EMEA region specifically which includes Africa of course, Manhattan’s EMEA business unit delivered a total of $38.3m in revenue versus $32.2m in 2010 so a 19% year-on-year uptick. The 2011 result was the region’s second highest grossing revenue year ever. We’re not complacent though as there are many risks, in terms of the global macro-economic environment. All we can do is focus on those things we can control which is helping companies to mitigate risk in their supply chains and improving their overall supply chain performance. Manhattan’s continuous investment in R&D, and constantly evolving its solutions to help its clients keep pace with their ever changing and complex environments, puts the company in a good position to deal with the challenges of the next 12 months and beyond. In the coming years, companies will be looking for greater visibility of supply chain costs and activities so they can plan resources more efficiently. Companies will be finding ways to optimise productivity through improved task management, advanced labour management and use of voice technologies. IDC analysts suggest that the ‘lean manufacturing’ approach will help companies to respond better to the current volatile environment and take costs out of the system rather than transferring it between companies. These companies will make better use of real-time information about customer needs and buying behaviour and feed this information to their suppliers to increase order frequency, and better match supply and demand. Supply chain analysts in general almost unanimously agree that the best supply chains in the future will be those that have the best visibility in both directions . Technology will play a greater role in providing real-time visibility of sales and stocks to support the agility required in the current environment. Adoption of technology-led solutions will accelerate. Companies will continue to invest in centralised planning and forecasting processes that take into account a larger number of local factors. Suppliers who can keep pace, and indeed stay ahead, will win. It is expected that more companies will be looking for Extended Enterprise Management (EEM) solutions as they seek to gain control of their supply chain from source through to consumption. Distributed Order Management tools, in concert with EEM type solutions will enable orders to be fulfilled from wherever it makes most sense to fulfil an order from, balancing the need on the one hand to maximise customer satisfaction, and on the other to maximise profitability for the company in fulfilling that order. Increased visibility in the supply chain will enable greater control over activities within the chain, aiding agility while maximising profits and reducing risk. Supply Chain Junction Client, The Foschini Group, wins 3 major Logistics Awards. Is Slotting Optimisation Ready for Prime Time?